CPERS Dean, Prof Elmer Labad together with the College Secretary Prof. Inocencia Rivera and Faculty Club Board Member Mr. Reynaldo Macaso Jr. Turning over gifts to RSCC represented by Mrs. Jessica Agustin, the RSCC Nurse. The College of Physical Education, Recreation and Sport (CPERS), in consonance with the University’s theme “La Universidad para na servicio de Communidad”, successfully organized a community outreach program in Barangay Talon-Talon, Zamboanga City last February 12. This year’s recipient is the Reception and Study Center for Children (RSCC). The college chose the institution as its beneficiary since the Center also serves as a practicum field for students taking up P.E. 154 (Community Recreation Classes). RSCC is one of the institutions that cater to children, from infancy to 18 years old, who are abandoned or whose parents can no longer give the care and nurture they need. It is also an adoption center under the Department of Social Work and Community Development. It is also being supported by non-government organizations and chaired by Mrs. Josie Reyes, a social work professional. 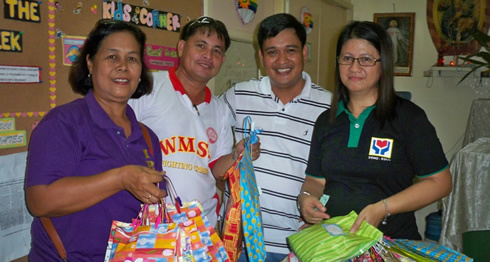 The college faculty and staff together with the energetic young dean, Prof. Elmer M. Labad brought along new sets of clothing and other children care products. They were warmly welcomed by the center nurse Mrs. Jessica Agustin and by the children. A short program was held and games were facilitated for the children through the Community Recreational Class of Prof. Teresita E. Bernardo. Meals was served courtesy of a local fast food store.